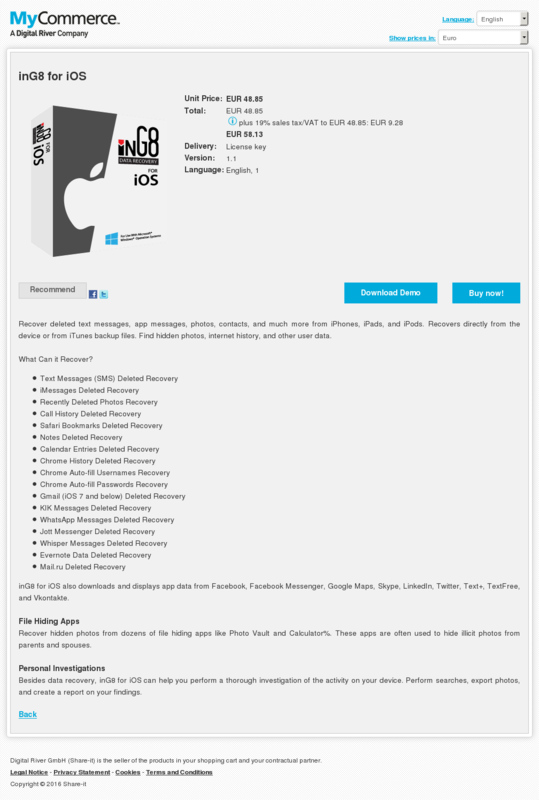 Recover deleted text messages, app messages, photos, contacts, and much more from iPhones, iPads, and iPods. Recovers directly from the device or from iTunes backup files. Find hidden photos, internet history, and other user data. inG8 for iOS also downloads and displays app data from Facebook, Facebook Messenger, Google Maps, Skype, LinkedIn, Twitter, Text+, TextFree, and Vkontakte. Recover hidden photos from dozens of file hiding apps like Photo Vault and Calculator%. These apps are often used to hide illicit photos from parents and spouses. Besides data recovery, inG8 for iOS can help you perform a thorough investigation of the activity on your device. Perform searches, export photos, and create a report on your findings.